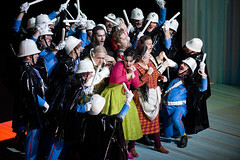 Italian-French costume designer Agostino Cavalca made his Royal Opera debut in 2000 on La Cenerentola and has since created costume designs for Madama Butterfly, Hamlet, Il turco in Italia, Il barbiere di Siviglia, Hansel and Gretel and Maria Stuarda for the Company, all directed by Moshe Leiser and Patrice Caurier. Cavalca studied fine arts in Italy before moving to Paris in 1982 to work as a costume designer for theatre and opera. He has collabroated with Leiser and Caurier since 1995, on productions including Carmen and Fidelio (Welsh National Opera), Aufstieg und Fall der Stadt Mahagonny (Lausanne), Ariane et Barbe-bleue (Opéra de Lyon), Lucia di Lammermoor (Opéra de Lyon and Théâtre du Châtelet), Der Rosenkavalier, Pelléas et Mélisande, Les Fiançailles au couvent, Der Ring des Nibelungen and Don Carlo (Geneva), Giulio Cesare in Egitto and Norma (Salzburg Festival), Die Zauberflöte (Vienna State Opera) and Rossini’s Otello (De Vlaamse Opera). Further opera credits include Rigoletto (Dutch National Opera), directed by Damiano Michieletto. Cavalca’s extensive theatre work includes designs for productions of Iphigenie, Le Misantrope, Othello, Richard III and La Surprise de l’amour. Our quick guide to Rossini's comic masterpiece, The Barber of Seville.